"You pitched the activities very well for the different ages and abilities of the children and gave them a real insight into the incredible timescale of the earth." Many Gloucestershire schools are now recognising the huge educational resource on their doorstep. Children are enthused by hands-on learning about geology, while teachers can deliver elements of the curriculum for science, geography, citizenship and education for sustainable development. 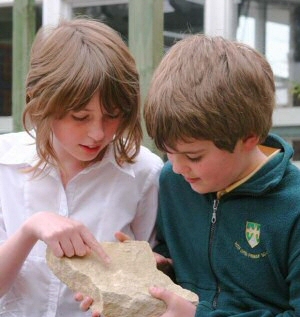 The Gloucestershire Geology Trust runs a programme of Rock and Fossil Roadshows, either for the general public or at local schools. The activities, such as making a fossil cast and identifying rocks in our everyday lives, are practical and educational. Teachers also have access to our new educational pack, with lessons on geological time and dinosaurs, focusing on the many footprints that have been found within the geopark. The Trust also runs fieldtrips to show the pupils geology in-situ and how the rocks and minerals have influenced industrial activities – and, in turn, shaped the landscape.